4th of July is one of my favorite holidays to celebrate with our kids. We usually have a huge bash at our house every year. The kids invite their friends, we have family and neighbors and have such a great time all day. Its a holiday I have always looked forward to and my kids are getting in on the excitement too as it becomes closer. 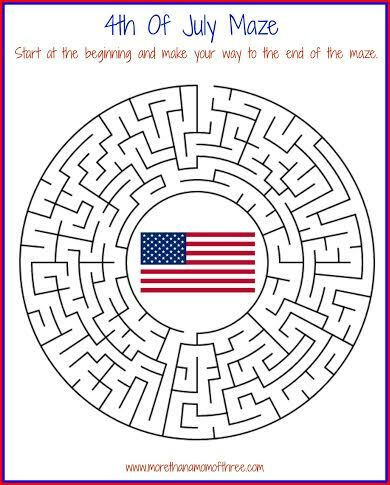 I decided this year to have some 4th Of July Activity Printable Worksheets on hand for the kids. My kids love them and I know it would make a nice educational fun activity for their friends. 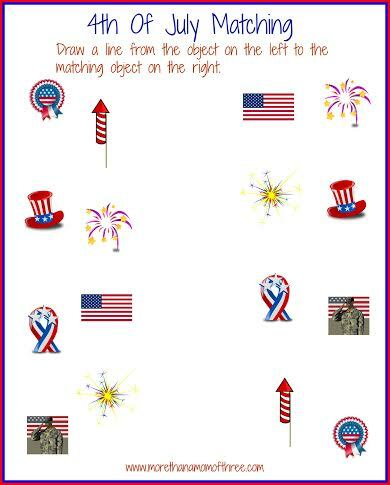 I have 5 different 4th Of July activity printable worksheets available for you to print completely free of course. 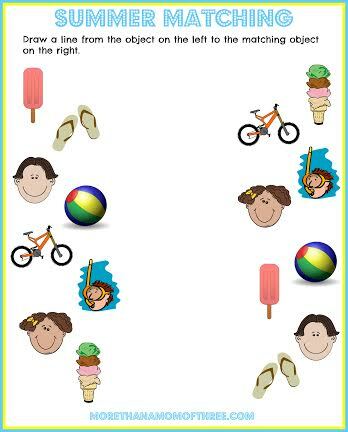 Don’t forget I made some summer activity worksheets as well a few weeks back. Feel free to print those too. 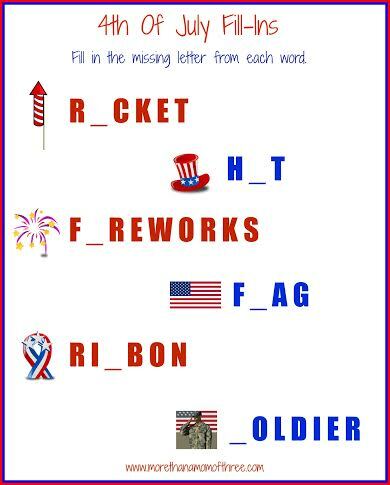 Simply fill in the letter that is missing in the 4th Of July themed word. Draw a line from the object on the left to the matching object on the right. 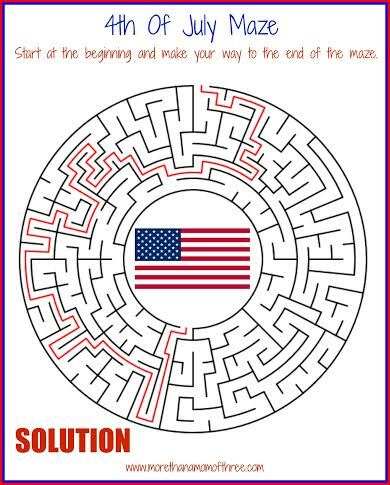 Get to the end of the maze to help get to the American flag. 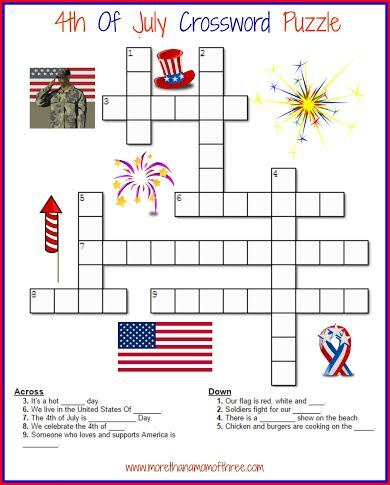 Answer the questions to complete the 4th Of July themed crossword puzzle. 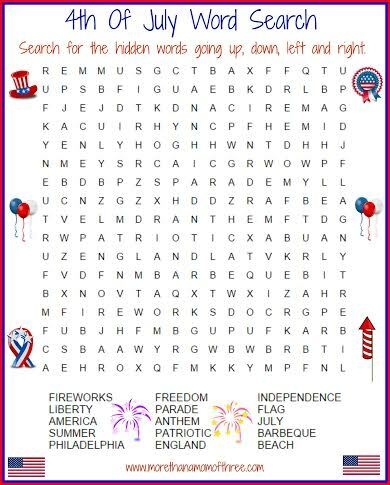 Search for the 4th Of July themed hidden words going up, down, left and right. 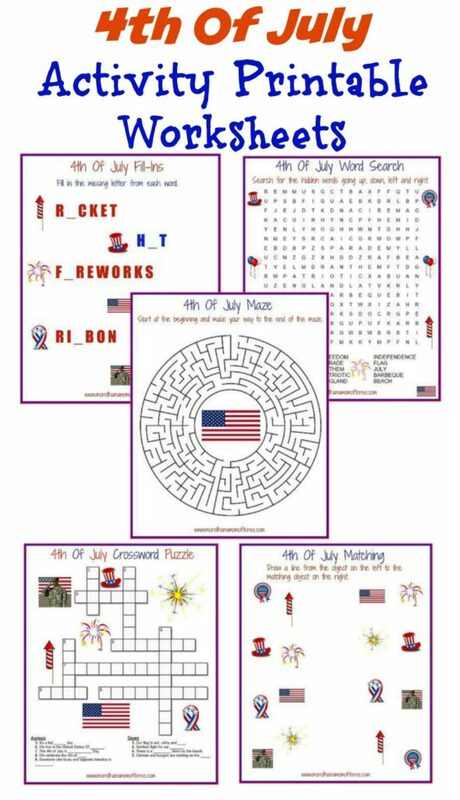 Check out this adorable 4th Of July Scavenger Hunt Printables from The Housewife Modern too! This is the first real week of summer for us and we have so many fun things planned. We sat down the other night and went over our summer to do’s. My kids came up with some great ideas for day trips for us but I am trying to keep them from getting bored on those down times of the day but also trying to implement fun learning where I can. 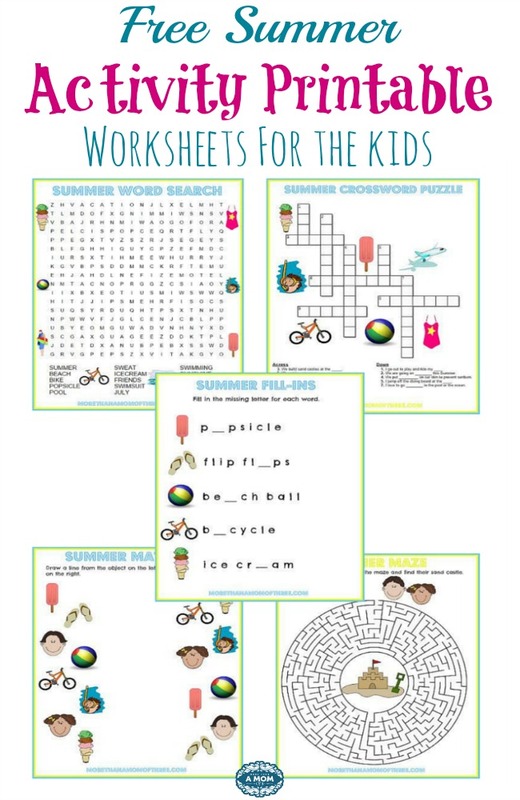 So today I have some free summer activity printables for you to print out and enjoy with your kids. Since JJ will be entering Pre-K in the fall this is a great way to get him used to the traditional worksheets he will be doing there. My kids love these worksheets when I print them out for them. Its a nice way for them to work together ( well for the most part) but it keeps them entertained in our late afternoons so I can get some housework done or start to cook dinner. 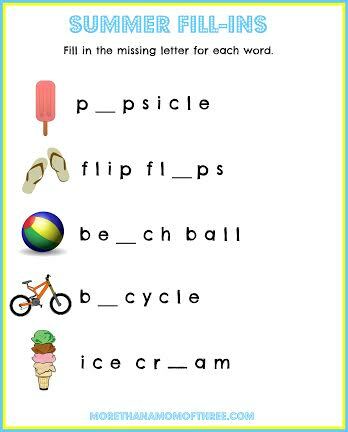 Simply fill in the letter that is missing in the summer themed word. 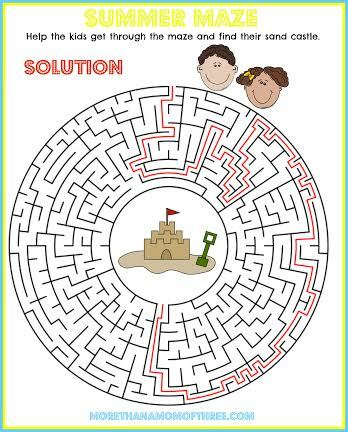 Get to the end of the maze to help the kids get to their sandcastle. 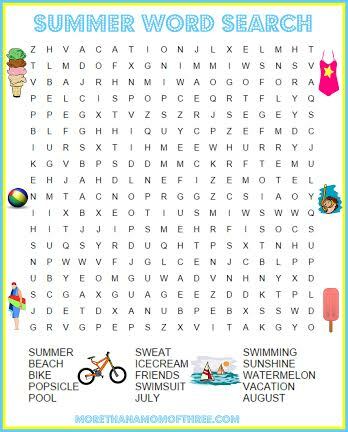 Answer the questions to complete the summer themed crossword puzzle. Search for the summer-themed hidden words going up, down, left and right. All of these printables are free a download. Hope your kids enjoy them as much as mine! Happy Summer! 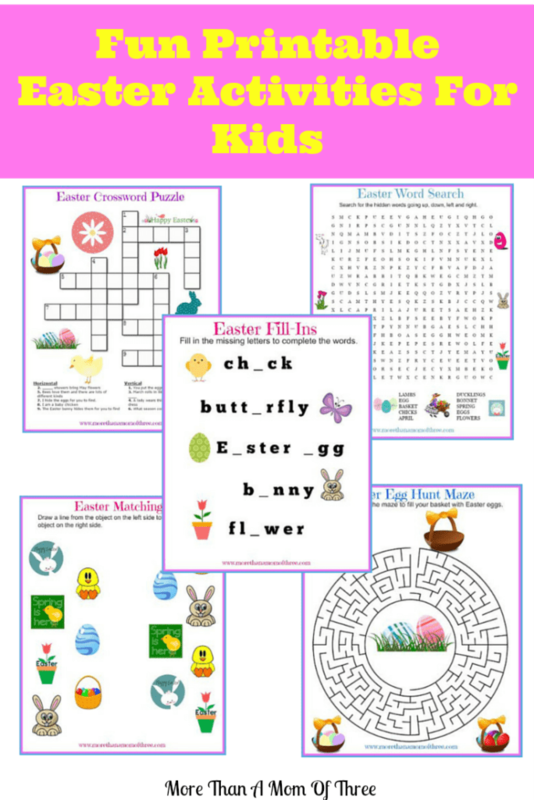 Easter is just around the corner so I wanted to have some fun printable Easter activities for my kids to work on to keep them busy and get ready for Easter. They love working on these printable Easter activities when I am trying to make dinner. It keeps them occupied and they actually enjoy helping eachother get the right answers. Today I have 5 printable Easter activities for you to print for free of course so feel free to print away and keep your little ones busy and fun learning. I have two for the older kids like the Easter word search and crossword puzzle. Then the last three are great for the younger ones, these are 4 year old JJ’s favorite. 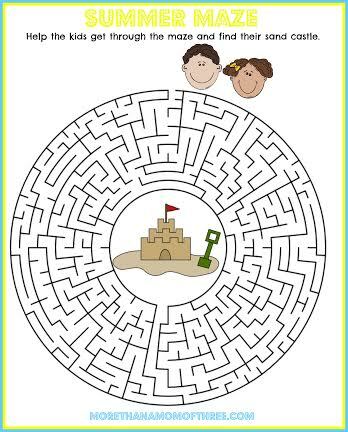 A maze, matching and fill in the blank as he is just learning the sounds of his letters to use them in words. 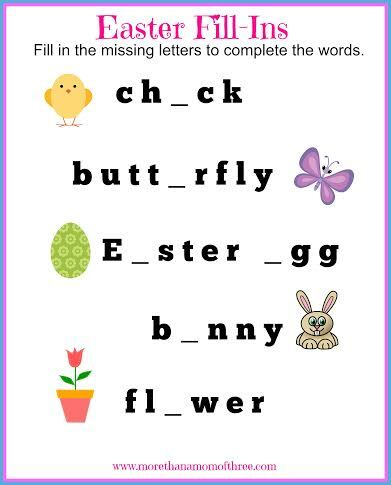 Easter Fill In – Simply fill in the letter that is missing in the Easter themed word. – Download the Easter fill in the blank printable. 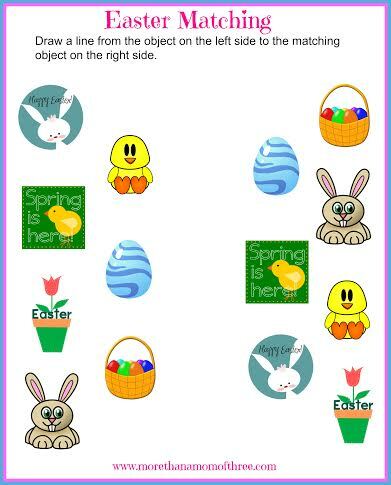 Easter Matching – Draw a line from the object on the left to the matching object on the right. – Download the Easter matching printable. 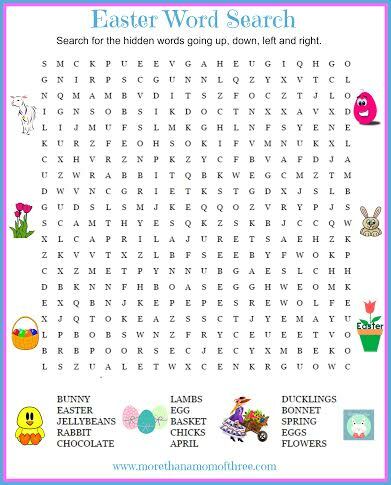 Easter Word Search – Search for the Easter themed hidden words going up, down, left and right. – Download the Easter Word Search printable. 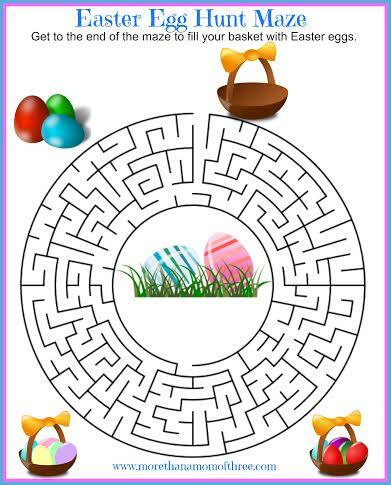 Easter Egg Hunt Maze – Get to the end of the maze to fill your basket with Easter eggs. 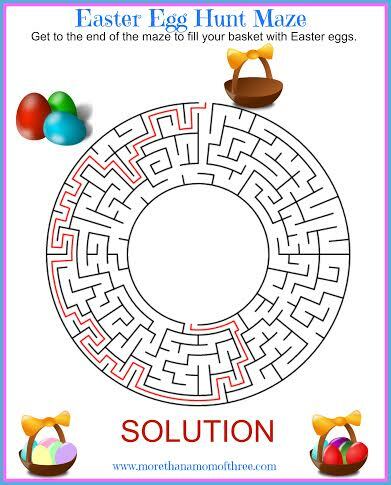 – Download the Easter Egg Hunt Maze printable and answer sheet. 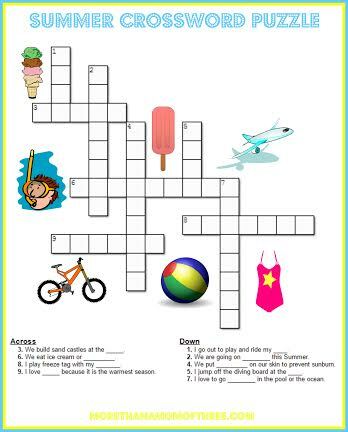 Easter Crossword Word Puzzle – Answer the questions to complete the crossword puzzle. 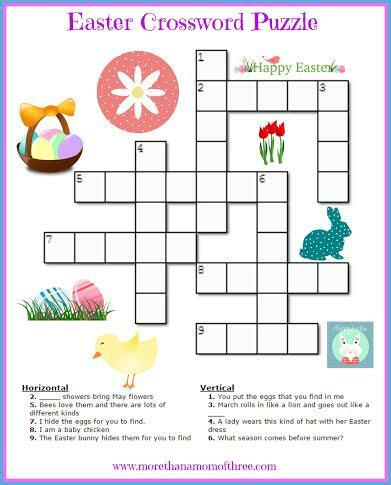 – Download the Easter crossword puzzle printable. Hope your kids enjoy these printable Easter activities and have a wonderful Easter! 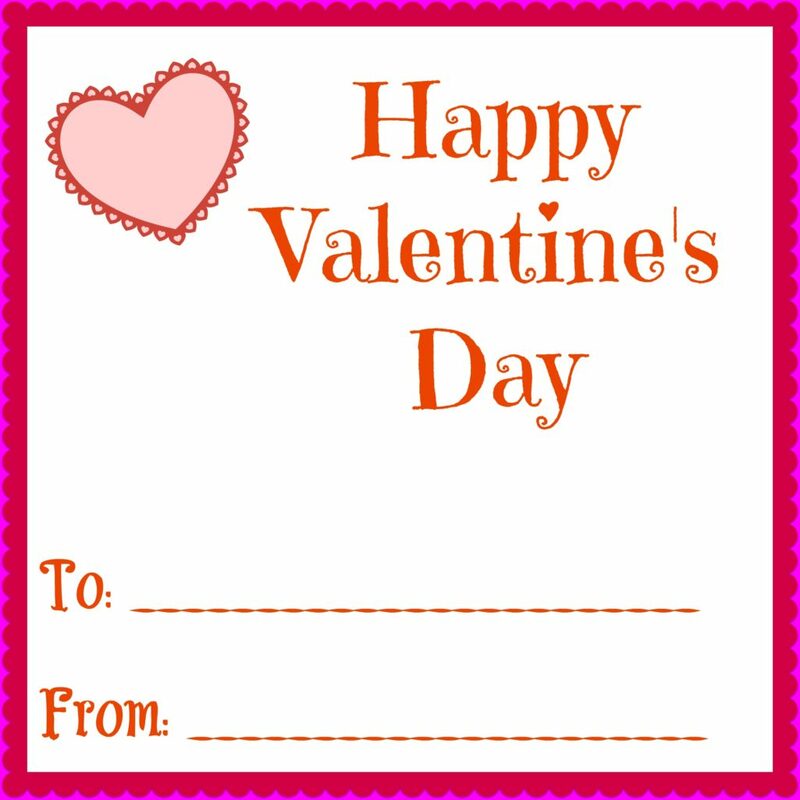 I have a fun little freebie for your kiddos today, a Valentines Day Word Search Printable. My kids love doing these. If you need a great learning activity for your kids, word searches are so much fun. 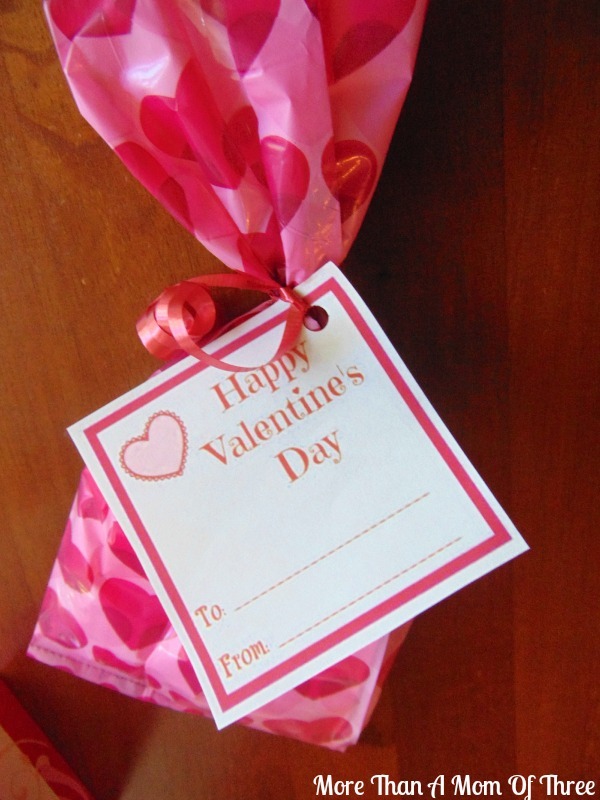 You can strengthen their vocabulary and spelling skills all in a cute Valentines Day word search. That’s what I call fun learning for an afternoon activity. This word search is for children ages five to 9 I would say. My son CJ is almost 6 and he was able to do it with some help from his big sister Bri who is almost 8. They sat so nicely last night and worked on the word search while I made dinner. I wish I had my camera to snap a picture. It was one of those rare moments they got along for more than 10 minutes and worked together. 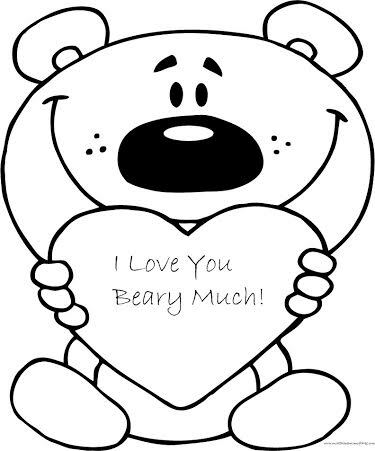 JJ felt a little left out so he got to color this I Love You Beary Much coloring page for daddy. That boy could color for hours if I let him. 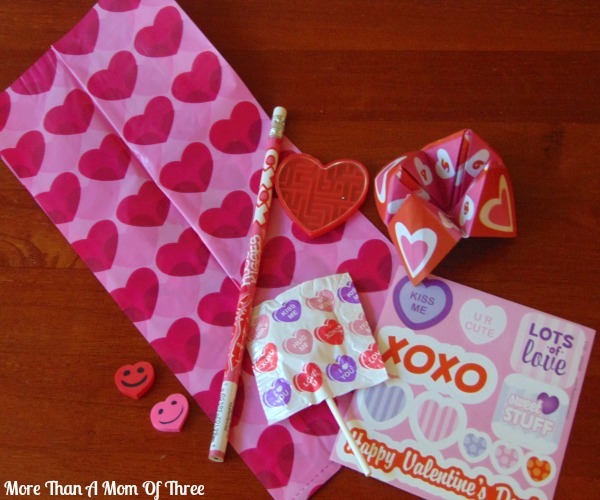 I hope you have some fun with your kiddos this afternoon with these fun Valentines Day printables. 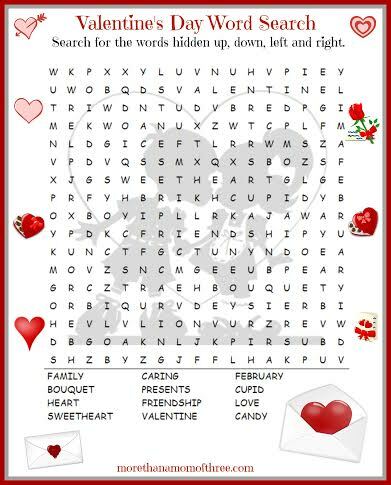 Download the Valentine’s Day Word Search Printable, print and let the kids have some fun learning time. 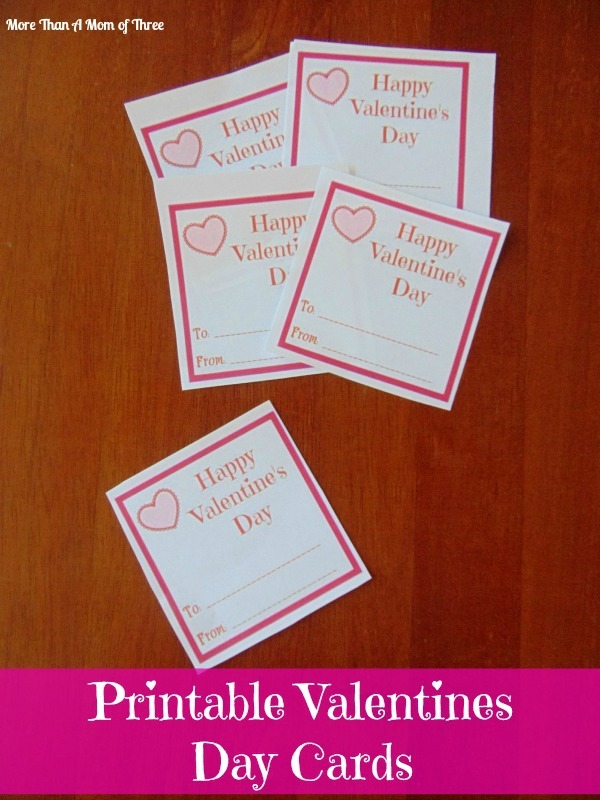 Printable Valentines Day cards are so easy and inexpensive. Today I have my latest cards I designed for you guys to download and use for free. I love making new printable Valentines Day cards every year for my kid’s classmates. It’s all about the little holidays for me that get me excited. Ever since Bri started school I have been the mom to make up little goody bags for each child in the class for Valentines Day and Halloween. I just think its so much fun to send in a little something fun for the kids on these holidays. Plus I’ll be real I am a tad obsessed with Oriental Trading and Amazon. They have such cute goody bag stuffers! This year I may or may not have gone a little overboard. Am I dating myself when I ask who else remembers those paper fortune tellers? My kids love it though and look forward to them every year now. I started a tradition I guess with them. For Valentines Day I add in a little card that my kids write out themselves. Adding in the handwriting skills for the little ones never hurts. 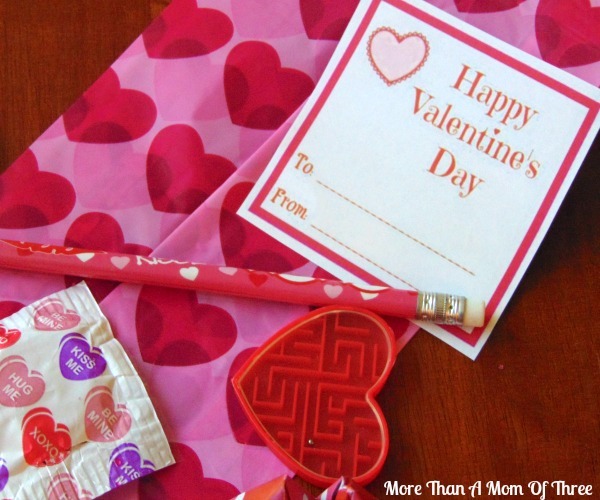 I love using free printable Valentines Day cards over store bought too. It really saves me so much time and money. You never know what the kids are into and with 2 classes to buy for it can get pretty pricey. I’d rather spend it on my goody bag toys and goodies. This year I went classic with reads and a heart. It’s just easier for my son and daughter no fighting over colors. 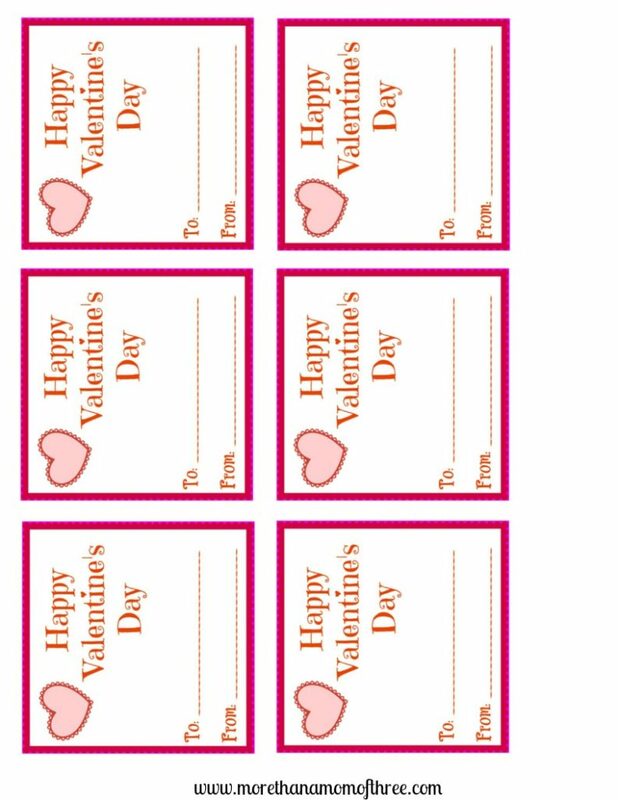 Grab some paper for your printer and download these free Valentines Day cards for your little ones special Valentines this year. 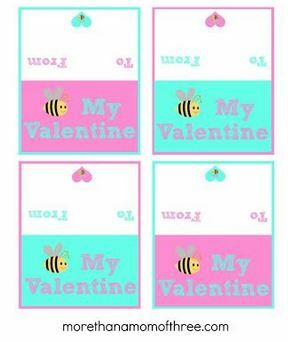 These Printable Valentines Day Cards will print, as shown above, 6 per page. Check out the Printable Valentines Day Cards I made last year. 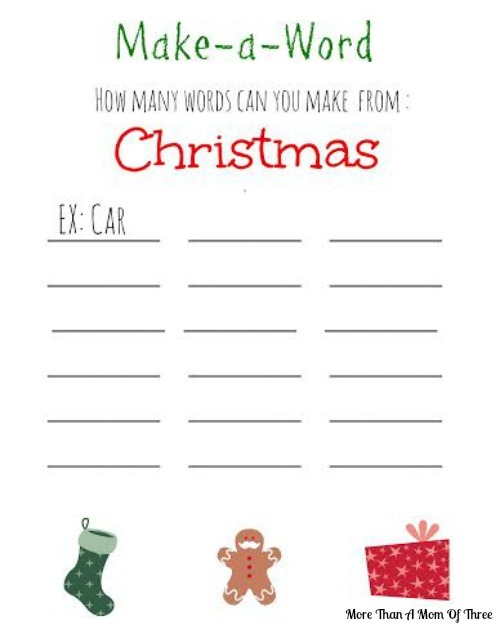 Christmas Word Printable WorkSheets are fun for the kids and a great learning tool. It helps when it has a holiday flare on it too, always more fun that way! So here it is, I have a fun little Christmas activity for your little one’s today. Make A Word activity sheets are always fun for my daughter and middle son CJ. It’s a great educational learning sheet for them to practice making different words out of one main word. With this make a word Christmas word printable, all you have to do is make different words out of the original word “Christmas”. This Christmas activity sheet is simple for children even at kindergarten level which is where my middle one is. They will have fun coming up with new words and this also helps with their handwriting skills. Perfect yet fun way to help them over their break from school, I love to sneak in learning where ever I can for them. Since they have almost 3 weeks off from school, I try to add one of these in at least a few times a week if I can. Hope your kids enjoy it!